Monétel - LISA 1 (10.03.2007) - Fête du timbre (Stamps Day) - Harry Potter. 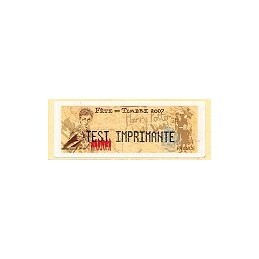 Mint test label - TEST IMPRIMANTE. Monétel - LISA 1 (10.03.2007) - Fête du timbre (Stamps Day) - Harry Potter. Mint blank label. Monétel - LISA 1 (10.03.2007) - Fête du timbre (Stamps Day) - Harry Potter. 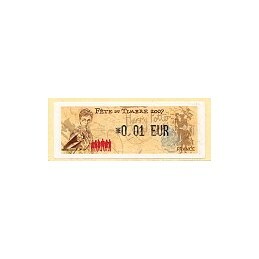 Double imprint - ATM (0,54 EUR) + test label - TEST IMPRIMANTE. Monétel - LISA 1 (10.03.2007) - Fête du timbre (Stamps Day) - Harry Potter. ATM, first domestic mail rate (0,49 EUR), with first day postmark in Valbonne. Monétel - LISA 1 (10.03.2007) - Fête du timbre (Stamps Day) - Harry Potter. First Day Cover with ATM (0,49 EUR), postmark Valbonne. Monétel - LISA 1 (10.03.2007) - Fête du timbre (Stamps Day) - Harry Potter. First day cover posted to Spain with ATM (0,60 EUR) and Valbonne commemorative postmark. Monétel - LISA 1 (10.03.2007) - Fête du timbre (Stamps Day) - Harry Potter. 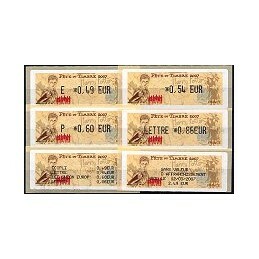 Mint set 4 values (E 0,49 - 0,54 - P 0,60 - LETTRE 0,86 EUR), with the original receipts of the vending machine. LISA 2 (10.03.2007) - Fête du timbre (Stamps Day) - Harry Potter. Mint blank label. LISA 2 (10.03.2007) - Fête du timbre (Stamps Day) - Harry Potter. ATM, first domestic mail rate (0,49 EUR), with 1st day postmark Aix-en-Provence. LISA 2 (10.03.2007) - Fête du timbre (Stamps Day) - Harry Potter. Mint ATM, first domestic mail rate (0,49 EUR), with 1st day postmark Marseille. LISA 2 (10.03.2007) - Fête du timbre (Stamps Day) - Harry Potter. First Day Postcard with ATM (0,49 EUR). Postmark Tours. LISA 2 (10.03.2007) - Fête du timbre (Stamps Day) - Harry Potter. 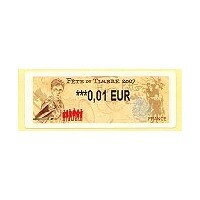 First Day Cover with ATM (0,49 EUR). 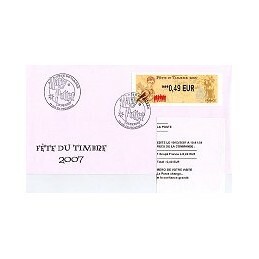 Postmark Marignane. LISA 2 (10.03.2007) - Fête du timbre (Stamps Day) - Harry Potter. First Day Cover with ATM (0,49 EUR) + original receipt of the vending machine - 1st day of issue. Postmark Aix-en-Provence. LISA 2 (10.03.2007) - Fête du timbre (Stamps Day) - Harry Potter. First Day Cover with ATM (0,49 EUR) + original receipt of the vending machine - 1st day of issue. Postmark Marseille. LISA 2 (10.03.2007) - Fête du timbre (Stamps Day) - Harry Potter. First day cover posted to Spain with ATM (0,60 EUR PRIORITAIRE) + original receipt of the vending machine - Postmark first day of issue in Aix-en-Provence. 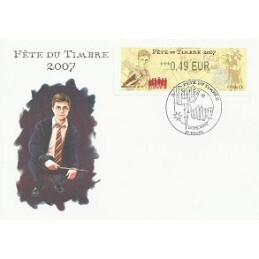 (10.03.2007) - Fête du timbre (Stamps Day) - Harry Potter. 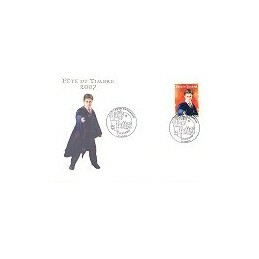 First day cover, postmark Nimes.